We're not here for beer, but we've still managed some good drinking. 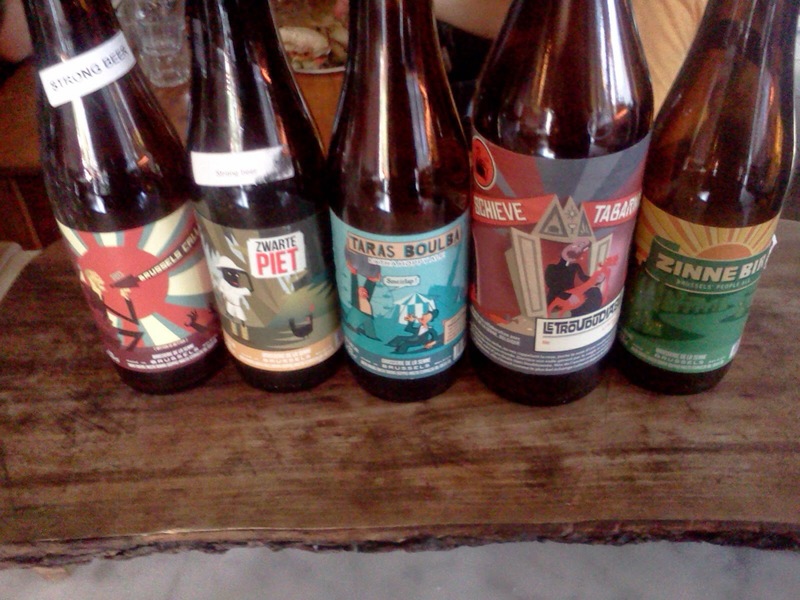 I forgot to bring a camera so I don't think I'll write a proper post, but needless to say I was pretty excited to be greeted by this display of beers from Brasserie de la Senne on our way into Bar Volo. We tried a fair few beers by local breweries as well, some familiar from previous trips (e.g. we first visited Bellwoods two years ago), some new to us. Stand outs included an English IPA on cask from Granite Brewing, and some beers by Dieu du Ciel and Le Trou du Diable. De La Senne is always a welcome site, and I've heard great things about the saisons from Bellwoods, Dunham, and Le Trou du Diable. Sadly the liquor laws here make it difficult to buy bottles to bring back with us. Bellwoods sells off site, but the selection wasn't very interesting this time. Mostly IPAs and pale ales. I have a bottle of a sour stout from a previous visit that I thought I could bring along if the saison and wilds groups meets in the next few months. Definitely hoping to get the group together at some point soon!